Are Replica Wheels Really as Safe as OEM Wheels? Are Replica Wheels Really as Safe as OEM Wheels? With the Internet, customers are faced with an unprecedented number of choices and can compare products to find the lowest price. Unlike visiting the local dealership, people shopping online aren’t stuck with just one option. With online retailers like Amazon offering low prices and free delivery, car dealerships struggle to compete. And OEM (Original Equipment Manufacturers) brands are fighting hard to bring customers back. For example, Mercedes-Benz joined forces with the Federal Chamber of Automotive Industries (FCAI) to prove that cheaper replacement wheels are dangerous. Mercedes-Benz representatives, along with the FCAI, orchestrated and filmed a road experiment to highlight the dangers of not buying factory parts. The video ultimately concludes that cheaper alternatives to Mercedes-Benz parts are downright dangerous. The next scene crystallizes the ominous warning. The camera captures the unidentified wheel shattering in slow motion as it runs over a pothole. The scene is played back repeatedly as the company representative narrates over it. Then, tasked with the same feat, the genuine Mercedes-Benz wheel drives over the pothole unscathed. The segment again highlights the dangers of not buying parts built by Mercedes Benz. Although this test seemed more like a PR segment than a truly independent examination, it got me thinking…are aftermarket wheels really that unsafe? If these wheels were coming apart on drivers, I assumed a trail of class-action lawsuits would ensue. However, local and federal court databases failed to reveal any litigation targeting aftermarket manufacturers. As an admittedly pro-OEM guy, my next (but reluctant) thought was what other facts am I wrong about? To educate myself and get the details straight, I did my own investigation. The first thing I learned was that “fake wheels” are kind of misleading. Unlike fraudsters hawking fake Gucci wallets, there aren’t any sellers offering “fake wheels.” The closest thing I could find was what’s called a replica wheel, a generic replacement part that functions and looks similar to the original product it’s intended to replace. I learned that the U.S. has anti-monopoly consumer laws that allow for this. Here 4 myths about replica wheels that my research dispelled, plus 5 signs the wheels you are driving on are dangerous and need to be replaced. This statement isn’t as much myth as it is misleading. There are several ways a wheel can be manufactured and the process of manufacturing is what ultimately determines wheel quality. Both factory and replica wheels vary in their production process. Some replica wheels are forged with precision detail while other OEM factory wheels are produced with simple casting. In summary, the quality of a wheel depends on how it was made, not who made it. Cast aluminum wheels, for example, are the most popular type of wheel on the road today. When hot molten aluminum is poured into a mold, it creates a cast wheel. 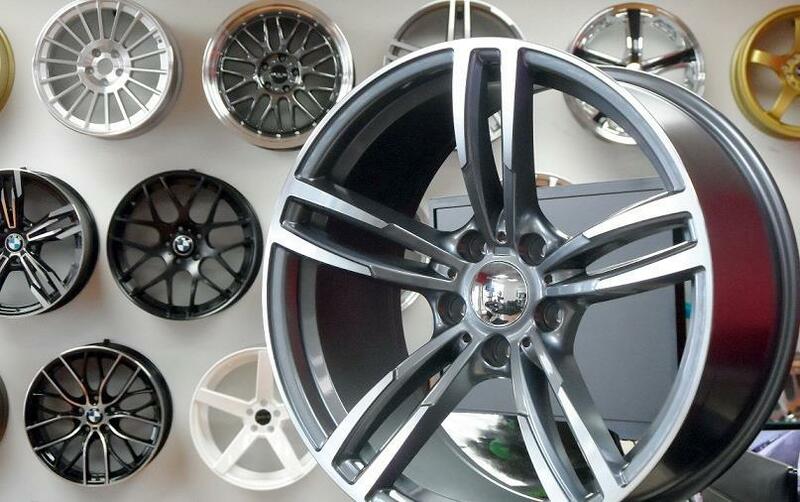 Aluminum wheels are the most popular types of wheel on the market today. These wheels are lightweight, inexpensive to produce, and come in a variety of shapes and sizes. Then there are forged wheels that are a dense piece of solid aluminum, stretched by thousands of pounds of pressure. This creates a much stronger and lighter wheel than casting but it’s also much more expensive. Then there are multi-piece wheels. This type of wheel is popular for custom orders. It involves combining two or three pieces of aluminum into one assembly, using special screws or rivets. And then, steel wheels, which are known for durability and being easy to fix. These wheels are commonly used on commercial trucks and consist of two pieces, the center and the outer barrel. Factory and replica wheels must meet stringent driving standards and carry a stamp on the back that details the load rating in kilograms. Since replica wheels are designed to replace factory ones, they usually meet the same load rating as a factory wheel for the designated vehicle. However, do your homework and read customer reviews on any aftermarket seller before doing business with them. One concern seems to be if a car has replica wheels, then it is somehow worth less than if it had the original, OEM wheels. Interestingly enough, some of the nicest pre-owned cars on dealer lots probably replica wheels on them. “We have car dealers as customers and they will sell some of their used cars with a replica wheel on them for better curb appeal,” Blue said. Most people cannot tell the difference visually between replica and factory wheels. Counterfeit or fake wheels are a copycat of the factory wheel and nothing more. Replica wheels have to meet a different standard with regard to patents and trademarks. Counterfeit or fake wheel manufactures are not obligated to any testing protocols either and are, as a result, putting your safety at risk. Counterfeiters have been known to pass off exaggerated stamping in an attempt to look genuine. Given the risk of this, these products are an inferior choice when compared to replica wheels. Still, not all wheels are created equal. That’s why it is important to do your research and know what type of wheel you are getting. Although replica wheels from trusted manufactures are safe, use caution when driving and avoid any large pot holes or bumps in the road. If you notice your car is acting funny after hitting a pot hole, you will want to get it checked right away. Vibration: If you notice your car is vibrating more than usual, it could be caused by a defect in your wheels. Flat Tires: If you are filling your tires up only to see them deflate, a crack in your wheel may be preventing it from holding air. Visible Damage: If you notice damage to a wheel after sustaining an impact, like running over a pothole, it may eventually break and cause an accident. Get it checked ASAP! Alignment: If your car pulls to one side when you take your hands off the steering wheel, a damaged wheel may be to blame. Bulging Tire: If you suspect wheel damage but can’t find any visible signs, inspect your tires for bulging, another sign of impact. 5 Comments on "Are Replica Wheels Really as Safe as OEM Wheels?" “We have to be bonded by the engineering and testing of our wheels,” Maybe it’s just poorly written, but his is the most meaningless statement I have ever read. It compromises the credibility of this entire infomercial. Engineering and testing represent processes, Here’s a short definition of “bonded” from Google: “Being bonded means that a bonding company has secured money that is available to the consumer in the event they file a claim against the company.” If replica wheels are bonded, why do the manufacturers not provide the name of the bonding firm? I’d love to put replace the grungy O.E. rims on my 2011 1SS Camaro with reasonably priced replica wheels, but I drive that car fast and my life is worth more than the price difference between replicas and replacement O.E. wheels. Luxury wheels are extremely expensive so some people tend to buy the replica just to have the design in just a fraction of the price of the original ones. I recently bought Fuel rims for my vehicle which is an aftermarket wheels. Well, it really depends on the vehicle owner. It just a matter of quality and looks of the wheels. I’m rolling on ADV.1 wheels and no doubt they’re a higher quality than OEM in every aspect.